Fan Hui has graciously allowed the following material from his book L'âme du go - les formes et leur esthétique (The soul of go: shapes and their aesthetics) to be translated into English and here incorporated into Sensei's Library. In the previous chapter we looked at basic shapes made up of stones of only one colour. 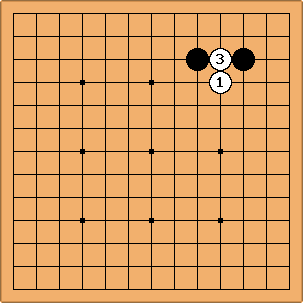 In this chapter we will look at basic shapes made up of both black and white stones. There are four basic shapes which are seen frequently in any game. They are common shapes because they are efficient. 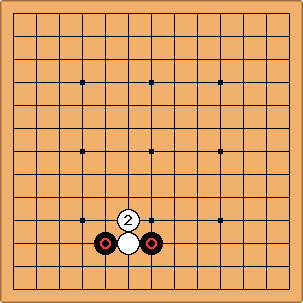 The two black stones in this diagram make up a keima, but the two white stones separate them: they "rip up" the black keima. 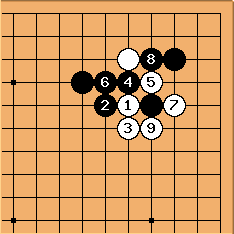 The white stones are solidly connected, whereas the black stones are divided and weak. This is a very bad shape for Black. You may say to yourself "Each player takes turns to play, so if White tries to cut, Black won't let it happen. So this is just a theoretical diagram and never happens in practice!". It is true that if White does play the first move of this shape (to prepare the cut) then Black will answer. However in Go common situations are always turning up in different ways. The next diagram gives a real life example. This is the beginning of a handicap game. White plays and Black answers . Next White normaly plays at , but here he makes a tobi and jumps with . Next Black has played threatening to cut, and White connects at . How does one evaluate these moves? Who gets the better deal? Is there a name for this shape? The shape is quite simply a ripped keima. The exchange is clearly good for White. 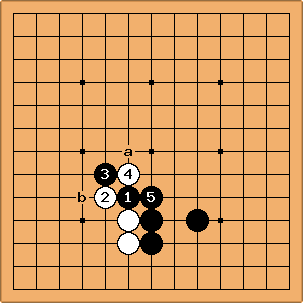 White never made a preparatory move to rip the Black's keima. Rather, Black set up a keima to be ripped! This sort of sequence frequently turns up in a game. If you don't pay attention, you can make bad shape without even noticing it. That is why it's important to know the ripped keima shape, so as to be able to avoid it early enough. This shape is called a ripped tobi. As with the ripped keima, the white stones are solid and the black stones are separated and fragile. This is also a bad shape for Black. It is as if White plays , threatening to separate Black, and Black does not respond to this threat. So rips up Black's tobi. 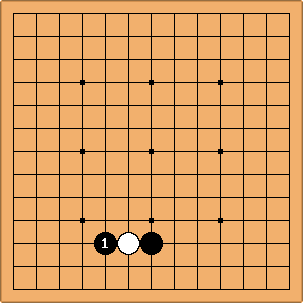 Here is one way this shape can arise: White has just played , a contact move on an isolated black stone. How should Black answer? Can Black attack White's stone with ? This seems like a very severe move, don't you think? White simply moves up with , and we have a ripped tobi: the two white stones have ripped up the black stones. Conclusion: in the previous diagram is no good. Clearly is no good either, otherwise White can make ripped keima, giving Black bad shape. Black doesn't need to look for overly severe moves. Either she can move up with or play a hane at 'a', reinforcing her first stone. If after White reinforces his weak stone with 'a', Black has a very good move to attack White, as we shall see later on. This is a rather special shape called an elephant's jump. It's quite different from a keima and has one weak point. Play in the middle of the elephant's jump! This move is called the elephant's eye and is the vital point of the shape. The shape is good for White. But: there is only one white stone and two black ones! How can this be good for White? 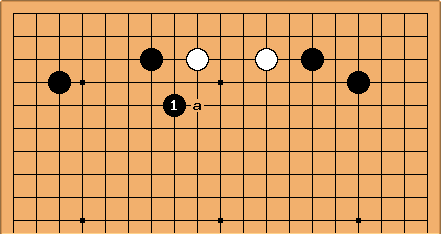 Black has only two ways to surround White's stone: 'a' or 'b'. Note that the four points marked 'a' are symmetrical, as are the two points 'b'. 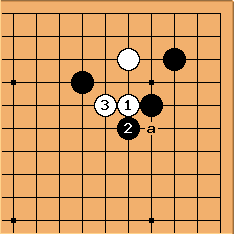 What happens if Black plays ('a' in the previous diagram)? White plays . Now look at and : together with the two white stones, they form a ripped keima. 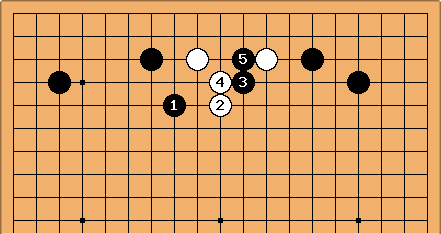 Black has let White make good shape! 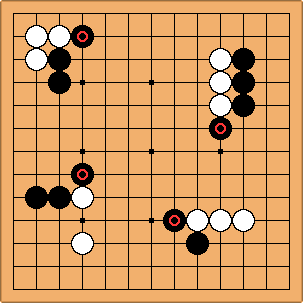 If Black plays a tobi to try to connect her stones, White will clearly cut. Here again we see a familiar shape: a ripped tobi, equally good for White. When White plays , Black cannot find a good move locally. 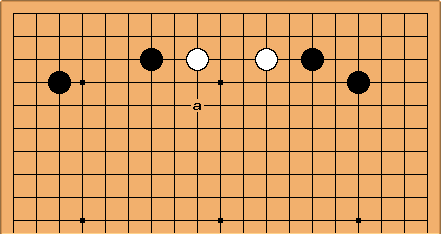 Both 'a' and 'b' give White good shape. 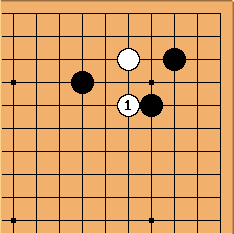 Black's two stones have no way of connecting up with each other. Hence, the elephant's eye is a very powerful shape. In order to understand this shape, one has to know what a hane is. In this diagram is at a diagonal with respect to the black stone already present. 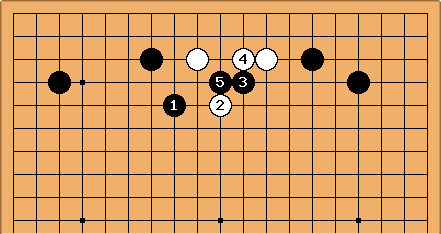 If this move is made in contact with one (or several) white stones, we call it a hane. The marked black stones in this diagram illustrate different types of hanes. This diagram shows a hane at the head of two stones. This special sort of hane is a very powerful move! Imagine, for example, two people of the same size, White and Black. 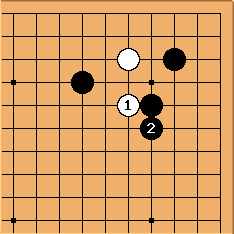 If Black gets to push White's head down, then Black will be higher. 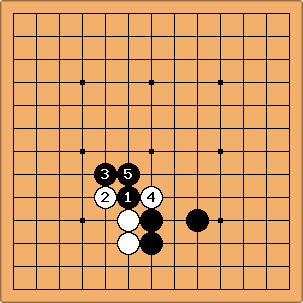 Black gets the high ground and opportunities to enlarge her territory. White has to take second place. 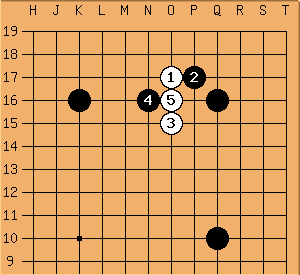 If White plays the hane after the hane - answering a hane with another hane - Black can simply fall back peacefully at . Black's head is still in front of White's, and White's shape has a cutting point, which is quite a burden on White. 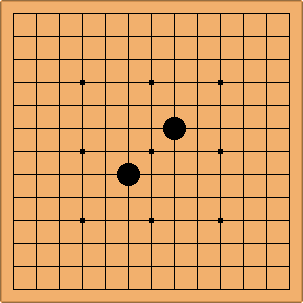 In this position Black starts with one extra stone than in the previous diagram. As she has a stronger shape, she can play a double hane. White has to retreat at , and then Black connects at , getting strong central influence. If White tries to cut with , Black connects at . Locally Black has more stones than White and Black's shape is much stronger than White's, so White is in a very dangerous situation. If White chooses to play atari on the other side, at , Black connects at . 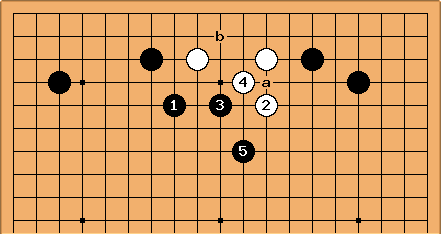 Then Black has a ladder at 'a' and an atari at 'b' as possible follow-ups. In both cases White is in trouble. 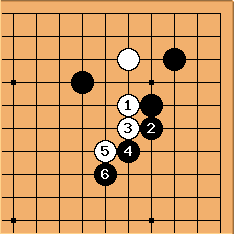 For all these reasons, it is said that a hane at the head of two stones is a very important move. In the previous pages we have presented four fundamental shapes. We now shall explore these shapes by looking at two common examples. 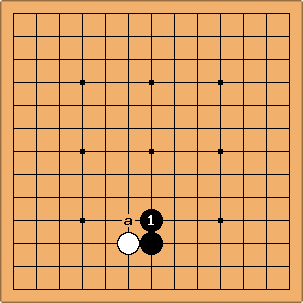 White has a two-space extension. 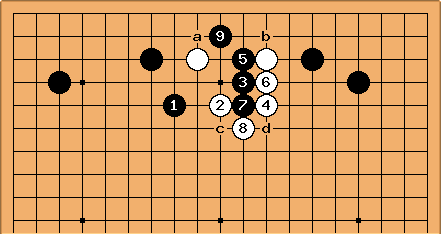 As White's stones are attacked from both sides, White should protect them with a move at 'a'. As White has omitted this move, how should Black attack? is a mistake as makes an elephant's eye which is bad for Black. How about the attack at ? Remember each line has its own function. The second line is reserved for yose, and for living or killing. It's rarely used for attacking. Black clearly can't kill with . At the end of the sequence White has good shape for moving out. As well, reduces the top right corner. The conclusion is that as Black can't hope to kill White, is not good. If Black merely plays the tobi in this diagram, she lets White off easily. White is happy to play and make comfortable shape. This is not a success for Black! The correct way to attack is with a keima at . 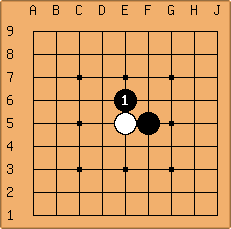 If White answers with another keima at , Black can play in the middle at , making an elephant's eye. White can't then play as Black makes the ripped keima. This is very bad for White. Similarly, Black also rips up White's shape with . This is good for Black. White tries to close Black in with but makes another ripped keima! What if White tries to trap Black with the tobi ? Black moves down with , and if connects then Black pushes at and then makes the diagonal move . Black now has a way out at 'a' and at 'b'. Also, there are two cutting points in White's shape at 'c' and 'd'. White can't protect them both. Black is satisfied with this result. 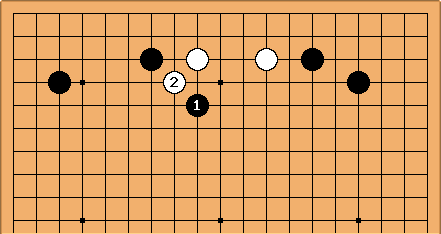 If White defends with then Black can play and White has to defend . pursues the attack. Black is doubly satisfied as her shape is nice and White's stones are still unsettled. 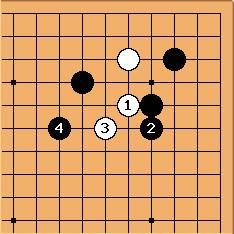 If White omits , then Black plays there instead. 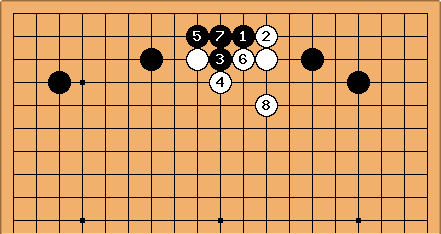 If White then connects at 'a' then Black makes a keima at 'b', separating White's stones. This result is even better for Black! The keima at is thus the right way to attack. 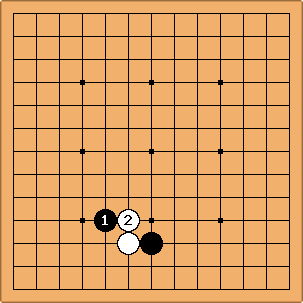 This move is a common way to attack, particularly for attacking two-space extensions. 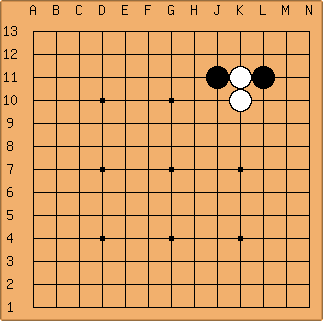 That's why it is very urgent for White to be the first to play in this area, preferably with a reinforcement at 'a'. 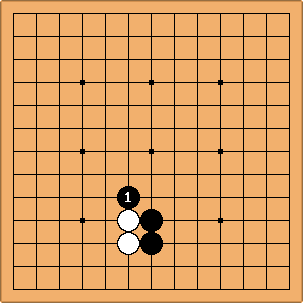 White is under attack, and has just moved out with . How should Black pursue the attack? Black may try a direct attack at . But White moves out with , making a ripped tobi. If Black cuts at , the moves to follow. 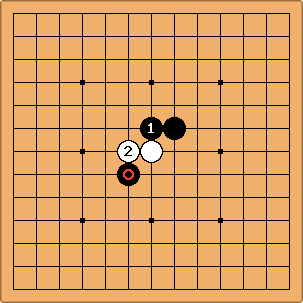 Black has captured one stone, but White is satisfied with settling his stones. If Black tries to cut straight away, what happens? 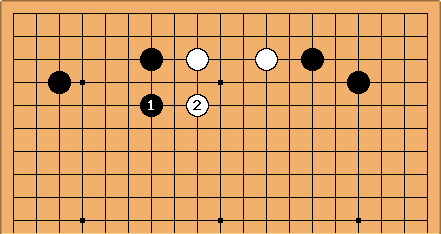 White answers at , then Black connects and White connects. Once again, we get the ripped tobi. As the black stone on the left is damaged, this is good for White. The hane at seems normal, but White calmy moves forward at , making an elephant's eye! 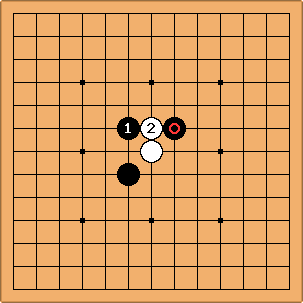 Black cannot then push in either direction, as otherwise White will make a ripped keima. 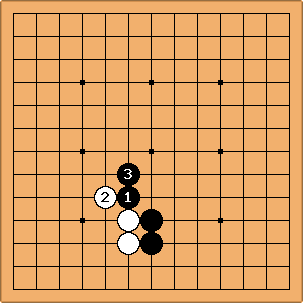 Also, White has a cutting point at 'a', so it's hard for Black to find a follow-up to for her attack. The right way to attack is to fall calmly back at . If White pushes at , Black gets to play a hane at the head of two stones! Black may even get to play a double hane at , which is bad news for White. If White plays tobi to move out, Black exchanges for and then also plays a tobi with . 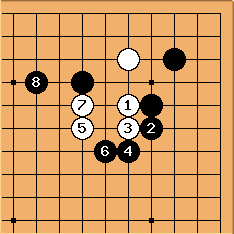 After this White's stones are very heavy and Black has made position on both sides, which is an excellent result for her. 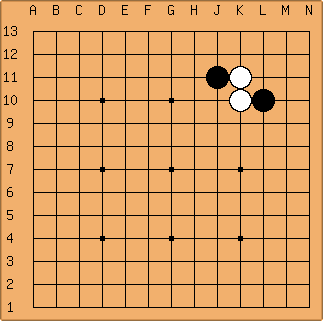 If White moves out with a diagonal move, Black simply follows. 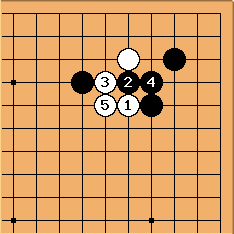 Black's stones on both sides are well placed; Black can be very happy with this result. 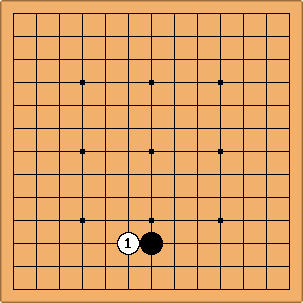 Summing up this example, Black can simply draw back with , avoiding unnecessary complications. 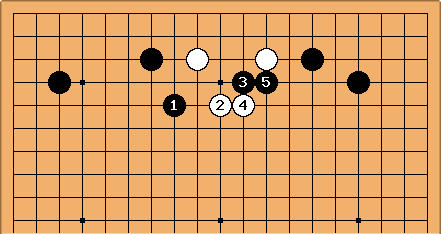 This is a situation where Black has to avoid pushing White. This translation was made mostly by Malcolm, with Fan Hui's prior consent. Malcolm: I think the idea is that the shapes are efficient for one of the players. Malcolm: sundered keima, sundered tobi would also be good translations of traverse-keima, traverse-tobi. Malcolm: Following one of Berlekamp's books, I've decided White is male (Right White) and Black female (Belle Black) here. ajs3: 38 Basic Joseki suggests that this attack is a success for Black (p. 55, dia. 2). Locally the diagrams (i.e., in this wonderful excerpt and in the aforementioned book) are identical, but the corner positions are different.